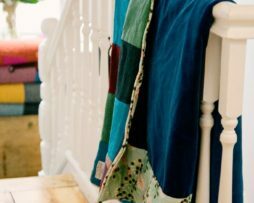 Quilts by Lisa Watson started over five years ago with a 100% British Made collection of traditional heirloom Quilts with a contemporary twist. These Lighter Weight Reversible Double Bed Size Quilted Shirt Quilts are stitched with British shirt fabrics of the finest quality. There are currently two contemporary designs and colourways to choose from; Oxford Blues Concentric design and Fife Brushed Cottons Geometric motif, both of which will fit well in any interior schemes. One of Kind Creamy Cotton Double Bed Size Quilted Quilts. 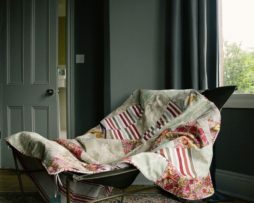 The Colefax and Fowler with Blue Azure Velvet and Harris Tweed Patchwork Quilt is truly British in its design and fabric combinations and is 100% British made. 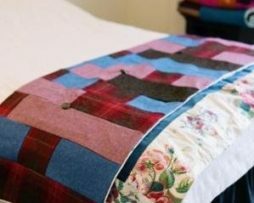 This Quilt is stitched in a traditional strip design made from; light blue, light pink and red tartan Harris Tweed, trimmed with Roses and Pansies fabric by Colefax and Fowler and backed in a blue azure velvet. 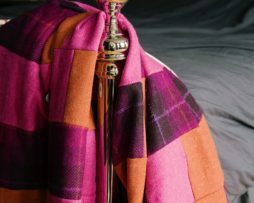 Brights Velvet and Harris Tweed Patchwork Double Quilted Throw 100% British Made. Brights Velvet and Harris Tweed Patchwork Double Bed Size Quilted Throw 100% British Made Heritage Quilt with a Contemporary Twist. 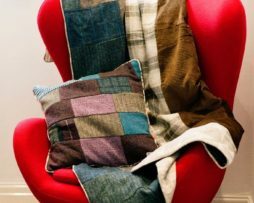 This quilt is stitched in a traditional strip design made from; grass green, candy striped red and white herringbone and red and blue tartan Harris Tweed, trimmed with Hemlock fabric by rising star print designer Annabel Perrin and backed in a royal blue velvet. This Bespoke Double Gentleman Explorer Quilt, inspired by the British explorer Ernest Shackleton is 100% British made with fabrics carefully chosen to reflect the age and times that Shackleton, encountered and inspired. The top of the quilt is Harris Tweed made from 100% wool. This is hardwearing fabric woven in Harris on the Outer Hebrides in Scotland, so the flecks of colour and weaves of the tweed fit in perfectly with the rugged landscape of Antartica where Shackleton and his men survived their epic adventure. The back of this Gentleman Explorer Quilt includes durable corduroy in just the right gents trousers shade encircled with utilitarian fabrics from Ian Mankin. This Gentleman Explorer Quilt fits a double bed comfortably at 200 by 150cm and can be yours for just £395. Please note: I make these unique quilts to order, so as with my commissions I say it takes 6-8 weeks to stitch a quilt from time of ordering. 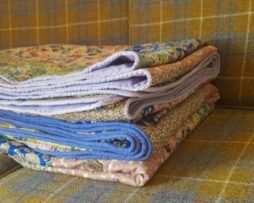 If you wish your own bespoke & unique Harris Tweed patchwork quilt, just click the link or e-mail me at lisa@quiltsbylisawatson.co.uk with your initial ideas and we can take it from there. I look forward to hearing from you. 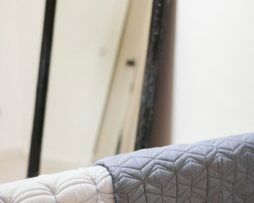 100% British made double bed size heritage quilt with a contemporary twist. 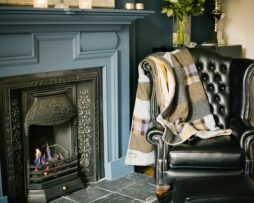 This quilt is stitched in a traditional strip design made from; sunshine yellow, grey and navy blue tartan Harris Tweed, trimmed with retro Hedgerow by renowned designer Angie Lewin and backed in a smoky grey velvet. 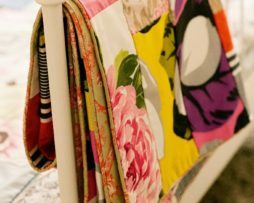 This quilt can be reversed for completely differing looks, dependant on your mood, the weather and your interior decoration! Sunshine yellow velvet and subtle blues, browns and greys double bed size Harris Tweed patchwork quilt, 100% British made heritage quilt with a contemporary twist. 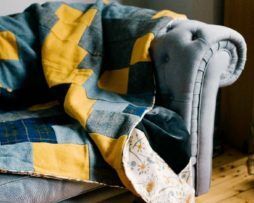 This quilt is stitched in a traditional strip design made from; subtle blues, browns and grey Harris Tweed, trimmed with Bukhotta by homes ware co. Tinsmith and backed in a sunshine yellow velvet. Flip the quilt to have it sunny side up to brighten any dull day! 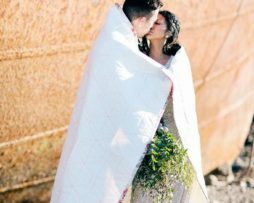 Quilts by Lisa Watson are a high quality heritage product for people to covet.